Berlin attraction-guides.com - Berlin, Germany attractions guide Berlin Brandenburg Gate (Brandenburger Tor) information about attractions, Brandenburg Gate in Berlin Area, Germany DE, construction, Friedrich Wilhelm II, East and West Berlin, symbol of German reunification, Room of Silence (Raum der Stille), location and address, Unter den Linden, opening hours, admission charges, and general tourist information about Brandenburg Gate (Brandenburger Tor) attraction in Berlin area, Germany DE Deutschland - Last updated 30/10/2012. The Brandenburg Gate was commissioned by Friedrich Wilhelm II in the 1700s to represent peace, and has become one of Berlin's most recognisable and photographed landmarks. Built originally as a customs post, the Brandenburg Gate was a principal part of the Berlin Wall and remained closed for the duration of the Communist rule. When the wall, originally the boundary between East and West Berlin, was knocked down, the gate became an important symbol of German reunification and it is the only one out of 18 similar gates that now remains. Designed in 1791 by Carl Gotthard Langhans, an intricate sculpture of the beautiful goddess Victory resides at the top of the structure. When Napoleon occupied Berlin in 1806 he stole this statue and took it back to Paris, but it was returned to its rightful home again in 1814. When the Berlin Wall was erected in 1961 the tor became a symbol of the division and when the wall was finally knocked down in 1989, Berlin held its main celebrations around this magnificent building. Over the years the Brandenburg Gate has been the backdrop for many protests and rallies by political movements and now, after several years of restoration, it stands proudly in the centre of Berlin. 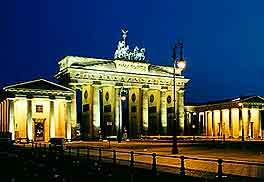 The Brandenburg Gate joins the two sides of the city and there is a busy road through the gate. In the Brandenburg Gate's north wing there is the Room of Silence (Raum der Stille) where visitors can sit in peace and quiet, contemplating the splendid architecture, which was inspired by the entrance to the Acropolis in Athens.